It’s that time of year again, cool morning, apples for days, an infestation of pumpkin spice, and the Animal Tales calendars are ready to be revealed. Each year I do two totally different calendars, picking themes based on my own life and adventures over the course of the last year. The themes this year are light inspirational humor (think friendship, love, and macarons) and dark humor (think mishaps that become adventures, uncanny bad luck, and humor as a survival technique). I am proud to say this year's dark humor calendar has returned to its roots of being charmingly dark enough to incite some pleasingly inappropriate laughter. Usually, I show you all the Tales in the calendar at this point. But this year I’ve decided to do things a bit differently…I’ve heard from a number of people that they don’t look ahead in the calendars because they don't want to ruin the surprise. 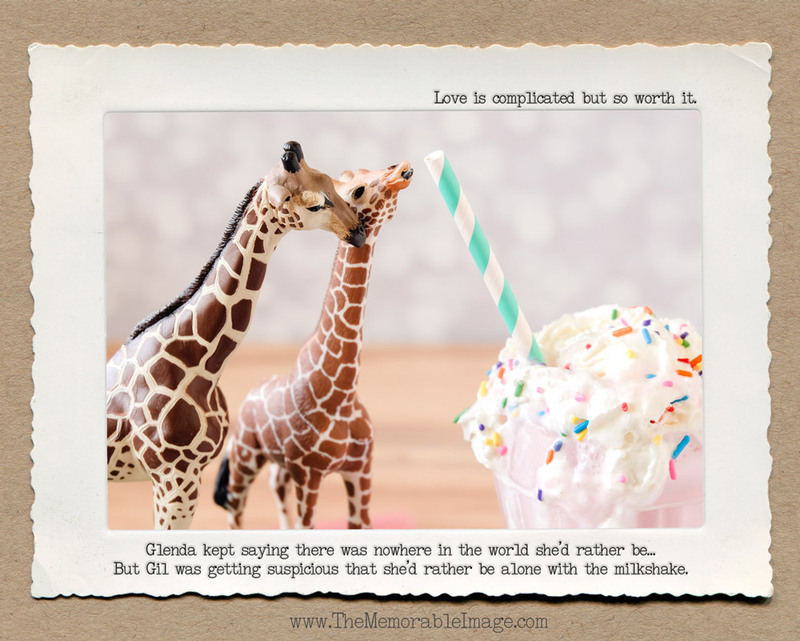 And I thought about that… I mean I would never do that, I am all about instant gratification (cake, chocolate, and photography all the way), but I understand and respect the sentiment. This year I’ve decided to reveal my three favorite tales from each calendar as a little bit of a tease so that you can get a sense of the flavor of each theme. This was one of those ideas that just came together; what I had in my head is exactly what you see on paper. This is also the story of my life: anything I get really excited about and try really hard at, I tend to break (just as dead basil plant #253 can attest to. He was clear evidence of that my passion for acquiring a green thumb is not a good thing). I won’t get into all the details about why this was a challenging shoot but suffice to say I rather embarrassingly yelled at my blender after making five melty milkshakes and still not getting the image I wanted. Obviously, the blender was not at fault. I love the sentiment behind this one. Relationships aren’t always easy. In an insta perfect world, everyone seems to be living the dream. But sometimes the dream means refraining from pushing your partner out of the way so you can have the whole milkshake to yourself. That is love. Beatrice may be my social spirit animal. The look on her face resonates with me; every time I try to go out and make new friends it is painfully awkward and always a little baffling (like there is a rule book or a how-to book that I’ve just missed out on in my life). Beatrice is just so relatable for anyone who has ever felt awkward in their own skin while trying to be personable. Moose. Rochester, NY I don’t know what it is with you and moose, but thanks to you they are my most requested animal ever. This year they make their debut (hint: there is a Great Moose Macaron Migration underway). A harsh, but amazingly cute life lesson about indulgence. Circus peanuts, but not the ones you are used to. The best Christmas decoration nervous breakdown tale I’ve ever written. The Calendars can be Found Here in My Etsy Shop. And now a turn to the dark side. This year I went back to what I love: emotionally unbalanced animals with ill will. I don’t need to say much about this one. It’s fabulous. It sums up many of life’s little surprises perfectly. 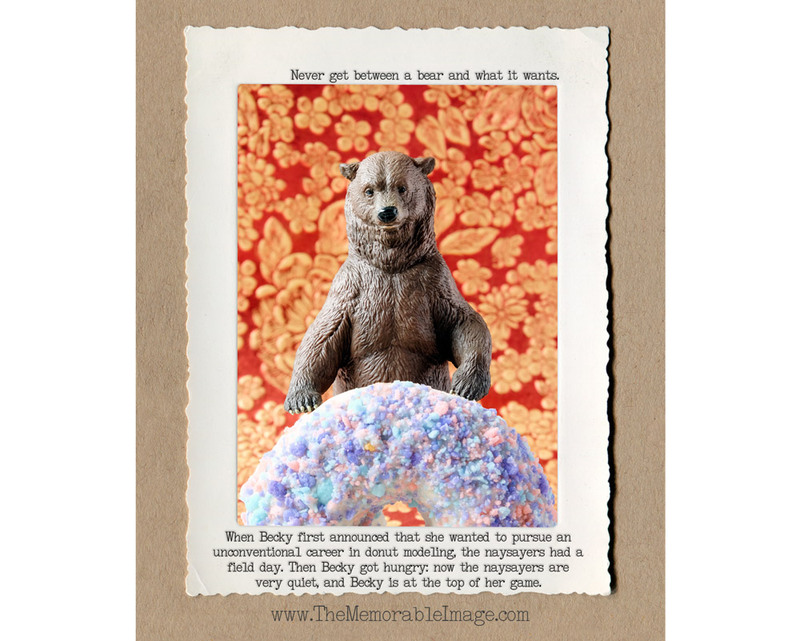 This is a return to and a growth on the bear storylines I worked the first few years of the Animal Tales. Bear’s don’t share. They are furry, but not friendly. They are majestically stubborn and strong and its best to stay out of their lives. Also, Becky is a bit aspirational: you should just get on with what you love regardless of what anyone else thinks. This is a new story from a familiar setting (remember Paul the penguin getting lost on the way to his family reunion on the glacier? Well instead of admitting he was wrong, and asking directions Paul has been stuck in what I have come to think of as Dandelion Villa purgatory… He has been there for about three years now. I’d say it’s growing on him, but that may not be the truth). And RBF lets face it…that is a real thing. Tanya being okay with it not being okay: Tanya is a favorite that has often been requested as an 8x10 print. This way you can have a calendar and a keepsake print after the year is done. A kookaburra who I also think may be a serial killer. A dinosaur gambling with love and his life. The makings of a great horror story. Now that you've seen a peek of both-which one if your favorite?